We know that polar molecules are attracted to each other by dipole-dipole attractions between the partial negative charge of one polar molecule and the partial positive charge on another polar molecule. Experiments have shown, though, that the actual strengths of the attractions between polar molecules are greater than we would predict from the polarity of the isolated molecules. The additional attraction is the result of London forces, which contribute to the attractions between polar molecules as well as nonpolar ones. Consider a sample of hydrogen chloride gas, HCl, being cooled to the point where the molecules begin to form mutual attractions. 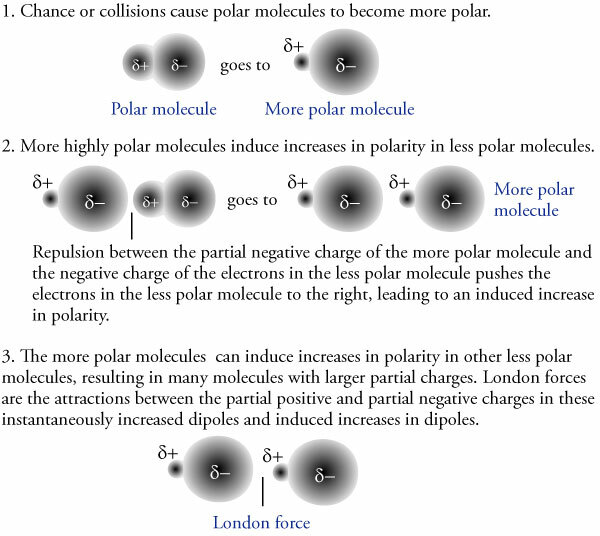 Because HCl contains polar molecules, we would predict the attractions to be dipole-dipole forces, but in fact, they are actually dipole-dipole forces that have been enhanced by London forces. Some of the collisions between polar HCl molecules shift the electron clouds further toward the particles’ partial negative ends. Molecules that undergo this instantaneous increase in their dipole are then able to induce an increase in the dipoles of other molecules. The increased attractions that result from these instantaneous and induced increases in dipoles are also called London forces. Therefore, polar molecules like HCl are held together by both dipole-dipole attractions and London forces. Combined, these forces are strong enough at –84.9 °C to cause the HCl to condense to a liquid (see below). We have seen that larger molecules have stronger London forces between them than smaller molecules. This generalization is true for polar molecular substances, as well as nonpolar ones. For example, the different boiling point temperatures of two substances that are commonly used in nail polish removers can be explained in terms of differences in their London forces. The boiling point temperature of acetone (2-propanone) is 56.2 °C, and the boiling point temperature of methyl ethyl ketone (MEK or 2-butanone) is 79.6 °C. Each of these molecules possesses one polar bond, the carbon-oxygen bond, exerting a dipole-dipole attraction. However, the larger MEK molecules have stronger London forces between them than the smaller acetone molecules do, so the MEK boils at a higher temperature.